ok sorry but basically your gonna help me build a awesome mini game. Thanks again... and ughh im so annoyed my world spawn is crapping out. For no reason its starting to tp worldspawnpoint players to the max of the radius!! Im so pissed cause there is plenty of open room at worldspawn. 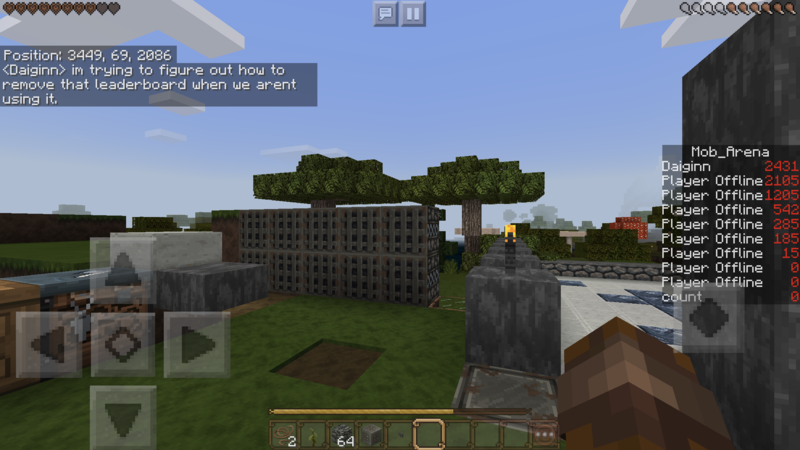 And all over the net they talk about spawnradius but bedrock apparently doesnt have that gamerule spawnradius, i checked in game everypossible way... is it possible as a short term fix if i make worldspawn 20 blocks below where i want them to land in solid ground..hoping it will correct them to close to where i want them?? After alot of resetting breaking beds and kill commands i got it to set back where i want it for now... its soo screwy i was spawning over 100blocks from worldspawn for no reason!! And even from a bed ! what can i do to have a command block tests if “daiginn” hits the button(thats on the command block or right next to it) and teleports “daiginn” to xyz... i got the simple second chain block /tp daiginn 222 22 222 but if anyone hits that button i get bounced around. So i need it only if “daiginn” hits the button. Sorry for the easy ones, but i tried testfor ~ ~ ~ and @s but stupid @s 99%of the time never works. And i searched for hours today on the net.found nothin, I want a trapped chest connected to a command block. When someone puts a emerald in the trapped chest the command block gives @p something.??? but this cannot detect how many emeralds there are in the chest. If the player puts a whole stack of emeralds in the chest, he will get the same result as he would get for 1 emerald. The chain block ~ ~2 ~1 does that mean u chained it 1 to the side not inline with the chest and first command block? I know it wouldnt matter if it were in line im just checking. and this would work with a trapped chest right? Yeah just change the "chest" to "trapped_chest" and attach the chain command block to the first one and match the coordinates. Ok did alittle reading on data” commands. And i still need alot more brain synapses to hold nbt” understandings... but i think I understand what u said. Sooooo... do i need a third command block chained to remove that emerald after they get what they purchased? How do i get that leader board to go away when im not in the arena? And maybe even only on players who are” in the arena not everyone? How do i remove one player from the leaderboard? but it didnt like “scoreboard” there ill look back again im sure i typed it wrong. within and greater than are supported in Java 1.13 but not in Bedrock. The reason it doesn't like "scoreboard" is because you need to specify the offset after the "execute" so it would look like this "execute @e[...] ~ ~ ~ scoreboard ..."